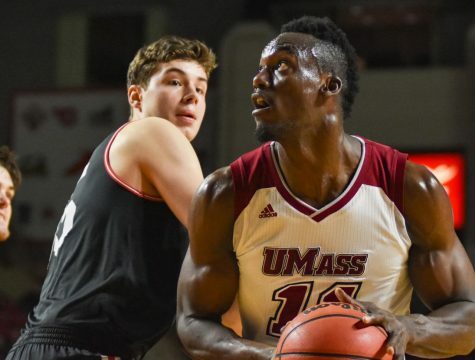 On a night dedicated to former Massachusetts men’s basketball coach and Hall of Famer John Calipari it was Trey Davis and Donte Clark that stole the show Wednesday. 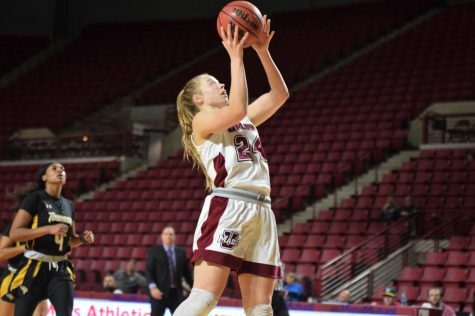 Davis scored a career-high 40 points as Clark chimed in with 30 as it took overtime for UMass (6-4) to take down New Orleans (3-6) 103-95 Wednesday night with members of the 1996 Final Four team sitting courtside. 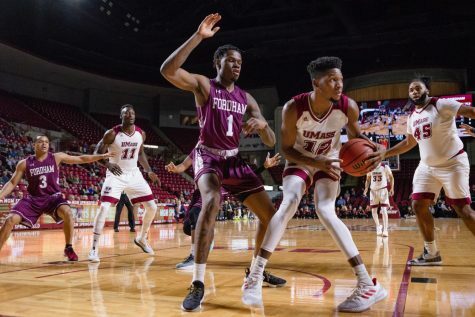 Davis’ 40 points were the most scored at the Mullins Center, beating the previous mark of 38 set by Marcus Camby –who was one of the former UMass players in attendance– against Dayton Jan. 6, 1996. Davis didn’t hesitate when he was asked if he knew he had 38 points as he attempted a layup and was fouled with two seconds remaining. 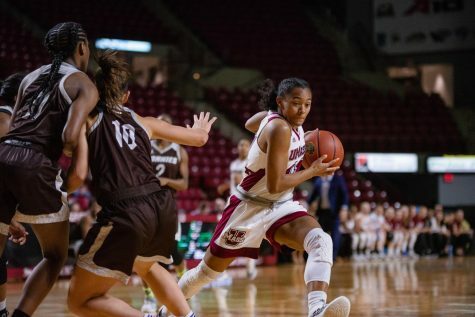 After a back-and-forth second half and start to the extra period, Clark hit a deep 3-pointer in front of the Minutemen bench to put them up 91-88 with 1:50 remaining in the extra period. 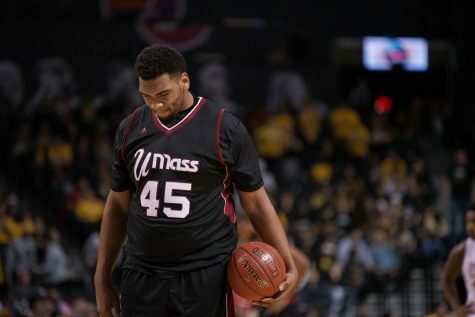 UMass didn’t trail again after that basket. “Oh yeah, I definitely thought it would go in,” Clark said about the late 3. “I wouldn’t say I was trying to deliver a knockout blow, I was just trying to win the game. I was just playing within and when my shot goes in, I’ll just take them,” Clark added. “We need those guys to score. I thought that those two and Rashaan (Holloway) were our only offense throughout the game,” Kellogg said. 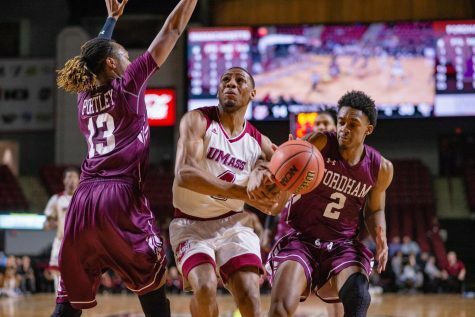 Holloway (13 points) was the only other UMass player in double figures. 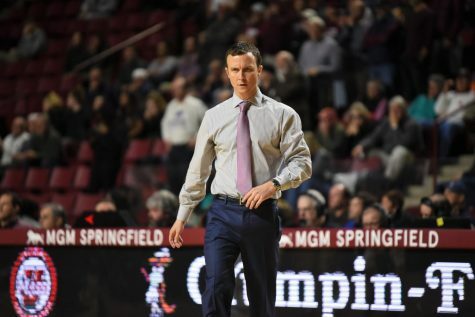 The Minutemen looked like they were going to cruise to the finish line after gathering an 11-point lead at the beginning of the second half thanks in part to a 9-2 run. However, the Privateers wouldn’t go away easily as neither team led by more than four points after Christavious Gill’s 3 cut it to 66-63 with 9:25 remaining. Six UNO players finished in double digits with forward Erik Thomas leading with way with team highs in points (16) and rebounds (13). “That team is feisty. I’ve watched them on tape a lot, they come in battle and scrap and they gave us everything we could handle tonight,” Kellogg said. The Privateers had a chance to seal the victory with five seconds left after a forced layup by Clark at the other end with 11 seconds remaining. Kevin Hill’s shot hit the side of the rim as time expired after Seth Berger had subbed into the game to defend him. 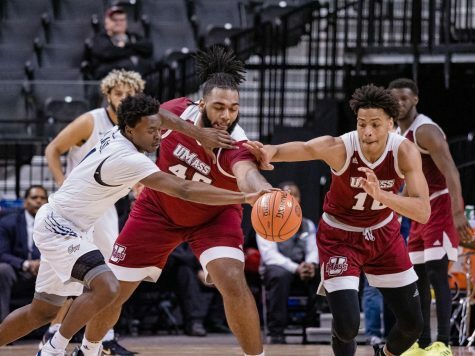 UNO looked like it was going to spoil UMass’ night of celebration early on as they led by as many as 10 two separate times in the first half. There were a total of 10 lead changes Wednesday night while the two teams were tied on 12 different occasions. While the majority of Davis’ points usually come from behind the 3-point arc, he spent the majority of the game at the free throw line, finishing 18-of-20. “Forty is 40. 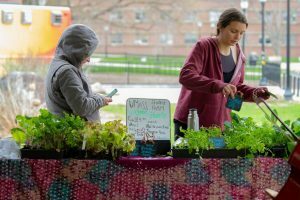 Whatever way you want to slice it, that’s a lot of points,” Kellogg said. 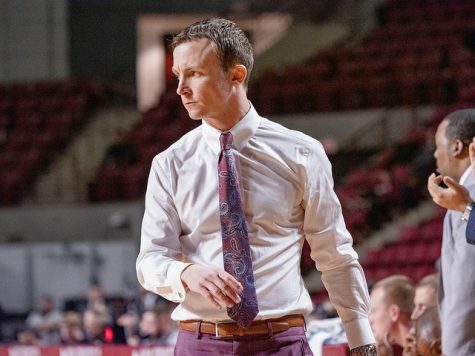 “There’s been a lot of really good players to come through these doors out here for him to score 40 in this arena and be the first one to do it is,” Kellogg said recalling former greats he’s watched and played with. However, it wasn’t the Calipari ceremony or the former all-time Minutemen greats in attendance that inspired Davis, it was something a little bit more personal. 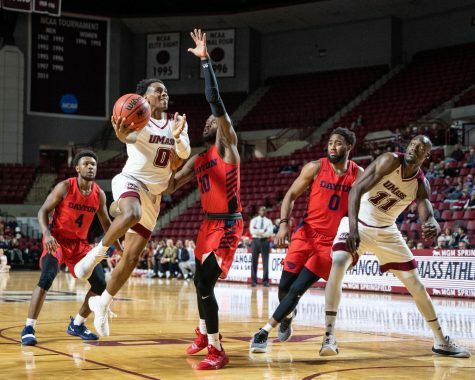 Davis’ mother turned off his cell phone after he shot 15-of-57 (26.3 percent) in UMass’ three-game losing streak against Mississippi, Central Florida and Florida Gulf Coast. “No, getting my phone turned back on was my urgency. To be honest with you, I really wanted my phone turned back on,” Davis said.